Reduce the redness of scars, flatten scars and minimise pain and itchiness, that can occur. The new Dual Action roller ball head massages the scar as it applies a very thin layer of gel. The Scar Spray is excellent for larger scars and burns and dries very quickly. 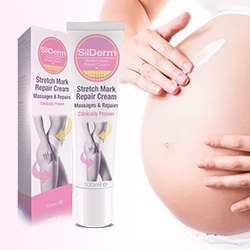 SilDerm™ supply the only clinically proven treatment for preventing the appearance of stretch marks. The Prevention Oil makes the skin more elastic and this means the skin will be less likely to tear and produce a stretch mark. A unique combination of ingredients proven to reduce the ‘orange peel’ effect associated with cellulite. Unique application provides massage, while the ingredients breakdown and remove fat as well as strenthen the skin. and kept secret by the ‘A’ List celebrities. 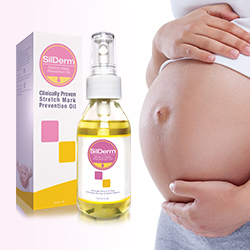 These products are now available to everyone under the brand name SilDerm™. to have evidence that their products are effective, but, often, the data does not stand up to scrutiny. All of the SilDerm™ range has been proven to be clinically effective.